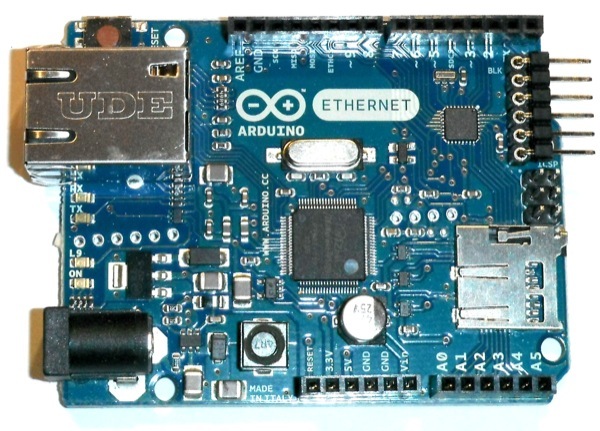 The Arduino Ethernet is an Arduino Uno bocked with an Ethernet Shield. You need a separate adapter to upload programs. If you got the Sparkfun version (it's generaly red), you may notice, that the ethernet card does not initialize correctely if only an external power source is applied. Powering the Arduino via USB works fine. In that case, simply put a 1uF capacity between the "reset" pin (+) and any of the "GND" pins (-). This well do a reset on power-up and re-initialize the ethernet card. After that hack the board operates as desired.